If you’re looking for timeless rather than trendy, then you have found the perfect product. Our men’s designer 6mm engraved and satin finish 14k white gold wedding band is stunning, masculine, contemporary, and yet still classic, ensuring that this ring will never go out of style. Just like a love that will never fade, classic appeal of this ring will ring true. 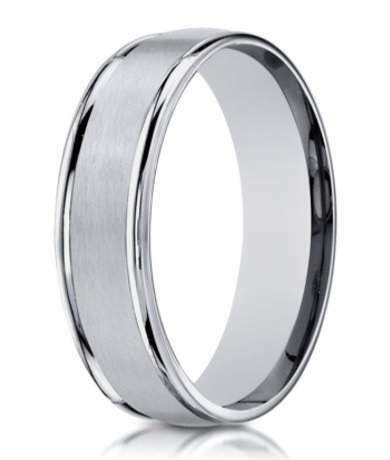 This 6mm comfort fit band offers a spun satin finish center underscored by polished edges. 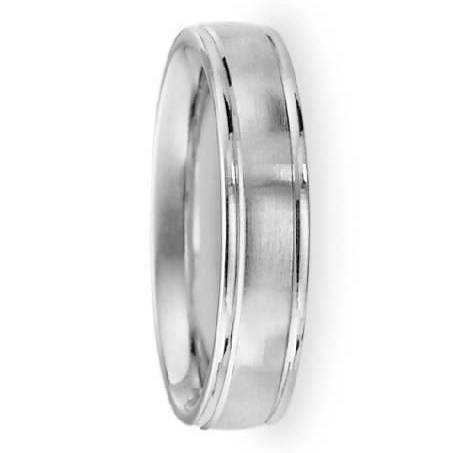 14k white gold is a rich and fitting medium for this contemporary men’s wedding ring. Comfort fit bands, like the one on our men’s designer 6mm engraved and satin finish 14k white gold wedding band, are comfortable for all-day wear and especially great for men with larger knuckles. Comfort fit rings usually measure half a size smaller due to the additional metal inside the ring. We recommend seeing your local jeweler to have your finger measured before purchase. We have a variety of sizes available so you are sure to find the perfect fit. If you have any questions, please feel free to contact a customer service representative.